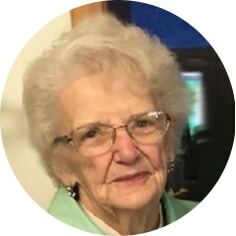 The family (Weiss and Box) would like to announce the passing of their cherished mother, Bonnie Box, on Thursday, January 10th, 2019. Bonnie was born in Moose Jaw on April 18th, 1936 where she attended school, worked, played and gave birth to 13 children. Always a busy, cheerful, strong, nurturing person, she will be remembered by all the friends she made where she volunteered at the gift shops at the Art Gallery and Moose Jaw Hospitals, at the bowling alley where she played on the ladies league for 55 years, and where she was a Ravishing Ruby with her Red Hatter group. She was predeceased by her husband, Harold; and sons: Terrance, Barry and infant Brent. Bonnie will be lovingly remembered by her 10 children: Brenda (John), Carey (Debbie), Sharon (Howie), Regan, Blaine (Susan), Kevin (Sherry), Darren (Melynda), Cynthia (Ryan), Adrian (Alicia), and Alan (Natalie); daughter-in-law, Sherry (Terrance); 18 grandchildren and their spouses; 10 great-grandchildren; sisters, Dorothy and Gloria; as well as numerous nieces and nephews. “Please do not cry just because we had to part. Carey and Debbie so sorry for your loss. You are in my prayers. Heaven has a new angel to watch over you from above and to catch up with those who have gone ahead. May the love of your families help you all during this difficult time! Cherish all the many memories of your amazing Mom! We are all so sorry to hear of her passing! Thinking of you all! My gramma will be deeply missed by many. Although I am grieving the loss of my last grandparent, I would like to send my condolences to my aunts and uncles that lost their mother. Hoping that the cherished memories give you comfort at this time. The Rebekah Ladies Bowling league express their condolences to the family of Bonnie. Bonnie enjoyed bowling. We all enjoyed Bonnie’s spirit and sense of humor. Sympathies from Elaine Hubbard, Vivian Warren, Donna Beattie, Marlene Golding, Marie Anderson, Gladys Pasquet, Laura Westfall, Stella Kuc, Megan Simmons, Jean Jackson, Lorna Bishop, Lorraine Gross, Francis Fritzsche, Rina Westbrook and Allison Rain. Our condolences to all of Bonnie family’s, She was a great,and kind person. Our deepest condolences to you Brenda and your family on the loss of your dear mom. May the comfort of her memories and her love be with you throughout this difficult time. Brenda, John and family….I’m so sorry to hear of your Mom’s passing. Love and hugs to all.